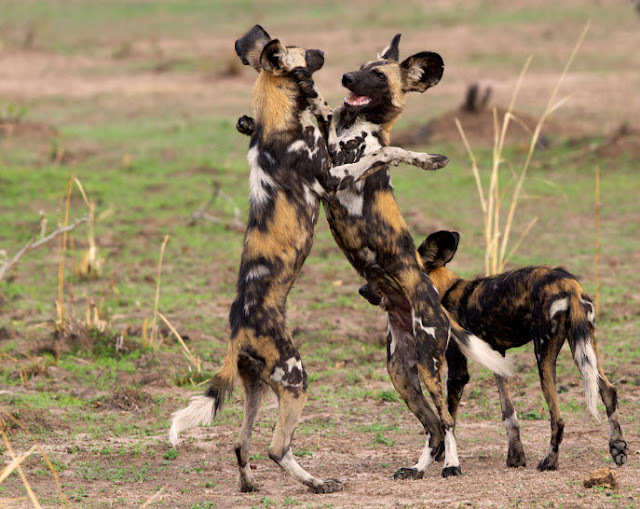 Main prey, wild dogs varies among populations but always centers around medium and large ungulates such as impala, Thomson's Gazelle, Springbok, kudu, reedbuck, wildebeest and calves. In the Selous Game Reserve, the most frequent prey is impala. While most of their diet consists of prey mammal, sometimes hunting birds of large dimensions, in particular owls. 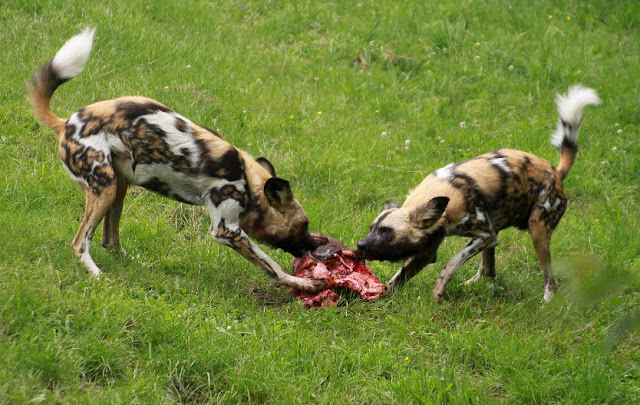 Other predators such as lions, sometimes steal the prey capture wild dogs. Some packages also include large animals among their prey like zebras, pigs and humans. 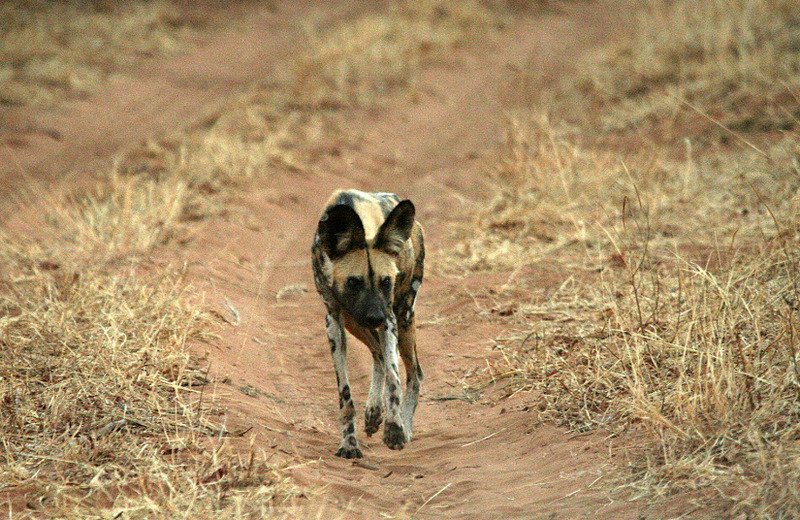 To hunt larger prey, wild dogs use a closely coordinated attack, beginning with a quick charge panic the herd. Wild male dogs usually perform the task of grabbing the boar nose. Studies show that this tactic of hunting large animals can be a learned behavior, passed on from generation to generation within specific hunting packs, rather than an instinctive behavior. In the Serengeti, the average density of dog (before local extinction of species) was a dog for every 208 km ² (80 square miles), while in the Selous Game Reserve the average density was a dog every 25 square kilometers (9 , 7 square meters MI). 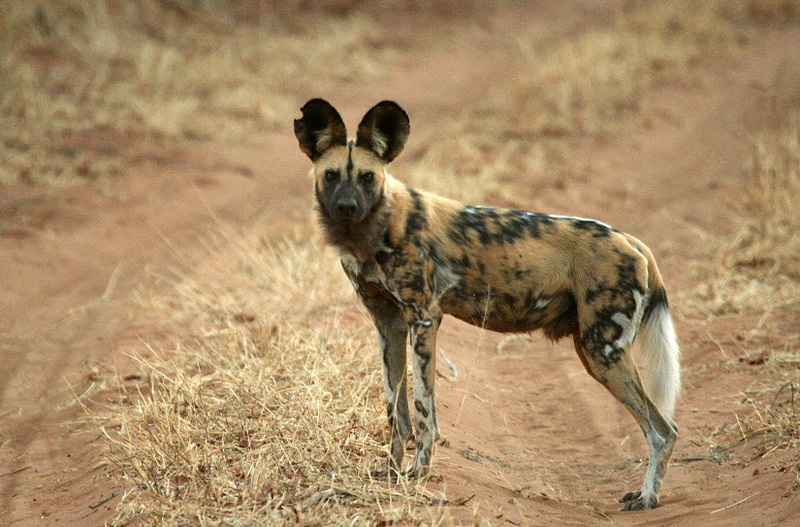 There were once approximately 500,000 African Wild Dogs in 39 countries, and packs of 100 or more were not uncommon. The smaller the population, but safe, apparently several hundred people in Zimbabwe (Hwange National Park), South Africa (Kruger National Park), and the complex Ruaha / Rungwa / Kisigo Tanzania. 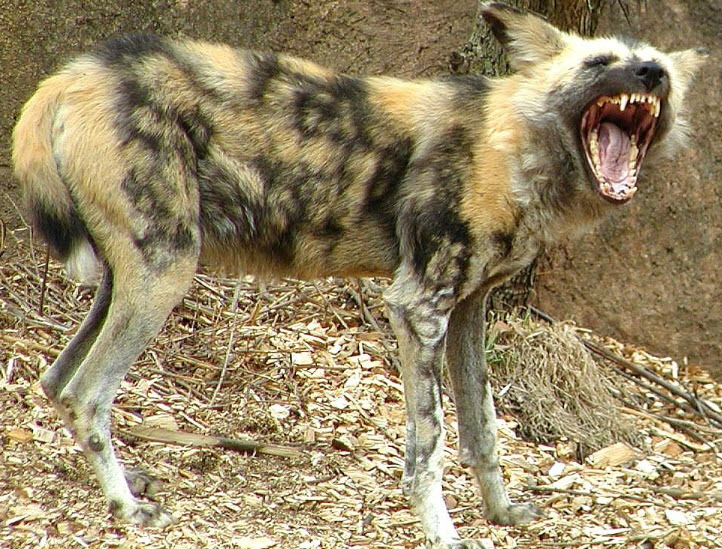 The African wild dog is endangered by human overpopulation, habitat loss and predator control killing. Uses very large territories (so can persist only in large protected areas), and is strongly influenced by competition with larger carnivores that rely on the same prey base, particularly the lion and spotted hyena. While adult wild dogs usually exceed the larger predators such as lions often kill many wild dogs and puppies chew site that can, but do not eat them. One by one the hyena is much more powerful than the wild dog, but a large group of wild dogs can get away a couple of hyenas for the team. Most African national parks are too small for a pack of wild dogs, and the expansion packs for protected areas, which tend to be ranch or farm land. Breeders and farmers protect their domestic animals by killing the wild dogs. Like other carnivores, the African wild dog is sometimes affected by outbreaks of viral diseases such as rabies and distemper and parvovirus. Although these diseases are not more pathogenic or virulent for wild dogs, the small size of most wild dog populations makes them at risk of local extinction due to illness or other problems.